Why Is It Called a Penny Loafer? How Does Peer Pressure Influence Teen Purchasing Choices? Peer pressure affects even well-behaved teens by influencing their buying choices. They might feel compelled to buy the latest electronic gadgets, shoes, clothing, cosmetics and hair products because people they know are buying those items. Helping your teen think for herself and make wise financial choices can influence her ability to make sound financial decisions later in her life. Negative peer pressure affects adolescents daily. According to the 4 Therapy website, the most difficult people to say “no” to are close friends, the popular clique, older teens -- including brothers and sisters -- and people they are dating. 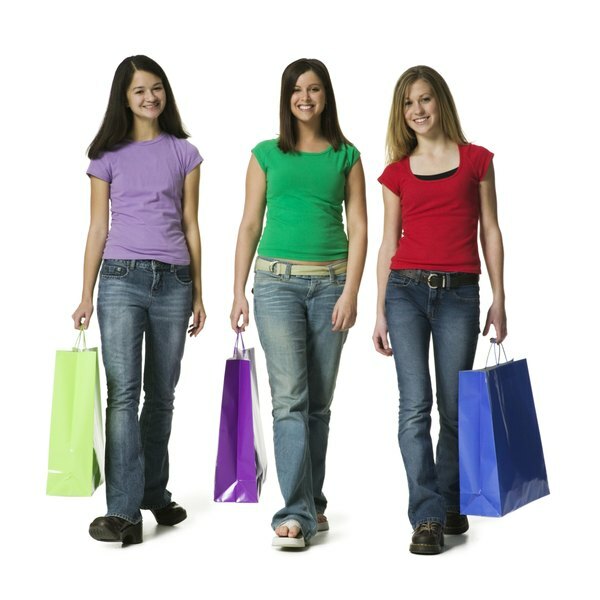 Praise your teen often when you see her restrain from buying unnecessary fad items and wasting her money. Explain that the ability to do this is a sign of maturity and a big step in becoming a responsible adult. Allow your teen to see you making smart choices, as suggested by Education.com. For instance, if her friend’s parents buy the latest SUV, say to her, “Those are gorgeous automobiles and it would be nice to have one, but our van is in excellent condition and should last for many more years.” Tell her there are other things that you need more and that keeping up with the latest trend is not a priority. Explain that she will deal with peer pressure all her life, but it is particularly intense during the teen years. Teenagers must learn to reverse the effects of peer pressure. That will not only make it easier for them to reject unnecessary purchases, but it allows them to refuse other detrimental behaviors. Advise her to think independently by having her assess the circumstances, come to a sound decision and then leave the temptation, according to 4Therapy.com. For instance, if people are wearing expensive pairs of lime green tennis shoes, she should think about whether they are really something she wants or whether she desires them because others are wearing them. Instruct her to count the cost. She can do this by asking herself whether they will match only one or two pieces in her wardrobe, thus making the cost of the item not worth the price. Tell her she can avoid temptation by leaving the store quickly before she starts doubting her decision.